A comprehensive guide on how to create, in a few simple steps, a fully functional vertical swipe view similar to the iOS Control Center. It can be used for your application settings or any other panel you want to be easily accessible. The vertical swipe view well integrates with your exiting projects. 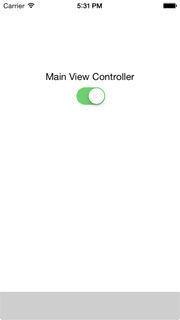 The following example has been tested using Xcode 5.1.1 on iOS 7.1.1 (iPhone version only). But it may likely works fine on other versions as well. Your comments or ideas on how to simplify this further are more than welcome! You can change the value of the offset based on your peferences. 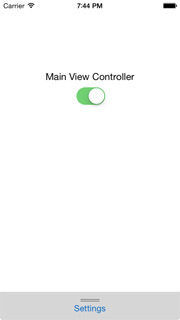 Add the following code in the ViewDidLoad of your Main View Controller. The comments will give you more detail insights on how it works. As you may have already noticed all controls on your main view are not working anymore. That’s because the scroll view lying above your main view will actually intercept all input touches. To solve this we should implement the pointInside method on the scroll view so to specify exactly when the scroll view will receive the input and when it will need to pass to the main view. It would be nice to have a touch gesture that could automatically open and close our sub view without having the need to drag it up and down. 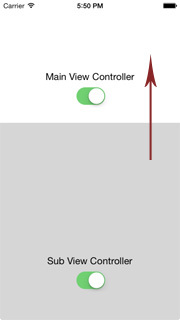 To achieve this we can simply add a button to the sub view and delegate the action to the main view controller so that it can adjust the content position on the scroll view. 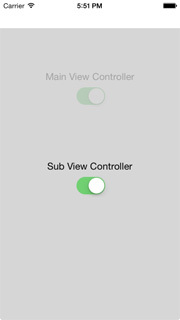 Then in the implementation of the SubViewController.m you should add the following IBAction implementation and connect it to a button on the top of the sub view. Please note that this vertical swipe view demonstration code works only on an iPhone and in portrait mode. But I'm sure you can easly customize it to work on a iPad and to accept different rotation modes.